The garden is warming up to the point that some of the things which have been in it over the winter are starting to bolt. I harvested my beetroots the other day, as they’d been in there since autumn. Time to pick them to make room for some more exciting summer vegetable. Beetroots are great to have in the garden over winter because while they are growing you can pick the leaves off them and eat them as you would spinach. So by the time you come to harvest the roots, you’ve had months of greens off them as well – making them a very generous plant. People think beetroot is messy to prepare, but I’ve worked out that by doing it the following way – there is not a stain anywhere. Not even on my hands. Ignore all the recipe books which tell you that they are too hard to peel raw and that you should cook then peel. Cooking then peeling = MESS! & They are no harder to peel raw than a potato. Of course you don’t have to cook them – you can eat them raw, but I prefer them cooked as I’m not a huge fan of their uncooked dirt-like flavour. 1. Fill the sink with warm water. 2. Chop the leaves off the beetroots. Keep the tender leaves for eating, (leaves not in this recipe, put them in your fridge and eat them later!) discard the rougher ones. 3. Throw the beetroots into the warm water. Using a potato peeler, peel the beetroots UNDER THE WATER. Check it out! No stains on your hands. Awesome. 4. Cut the wet beetroots into appealing chunks. Throw into a pot. 5. Fill the pot with 1/3 vinegar (I use white or cider), 2/3rds water, a teaspoon of salt and the spices of your choice. 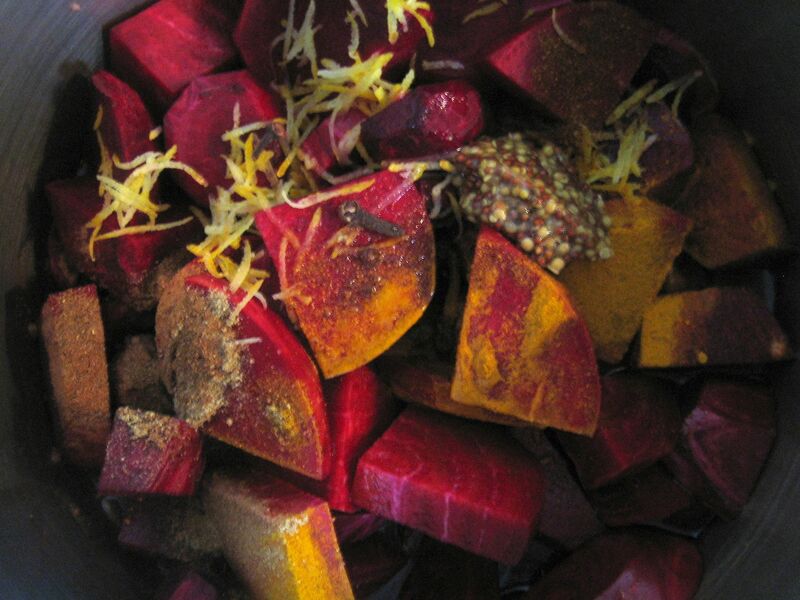 Because the beetroot is so plain and earthy tasting, I like to use strong flavours like a bit of curry powder, lemon zest, cloves and wholeseed mustard. 6. Boil until the beetroots are just tender. Cool. Eat! They are great added to salads, sandwiches or just as a side-dish by themselves. So there you go – that’s what I do with my beetroot! How do you like to eat beets? Love the tip about peeling them underwater! And yes, you exactly describe the dirt-esque flavour they can have…I find if they’re very fresh I can eat them raw but if they’ve been sitting round for a while the dirt flavour becomes accentuated and they have a strange bitterness, too. I love the peeling under running water tip. I like them raw with a scrummy tahini dressing in a salad, but I am making your recipe for lunch…without stained hands! 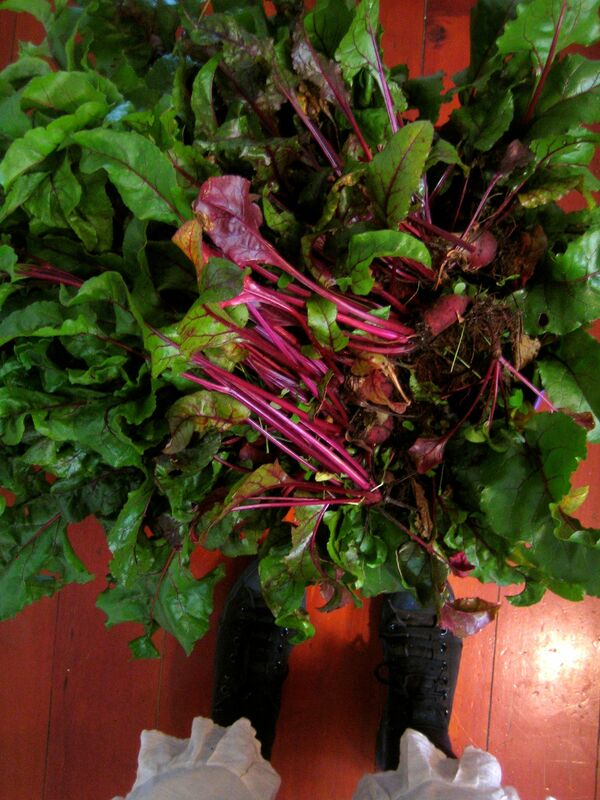 And I love that the members of my house who profess to dislike beetroot have been eating beet greens all winter. Makes me smile watching them eat dinner! 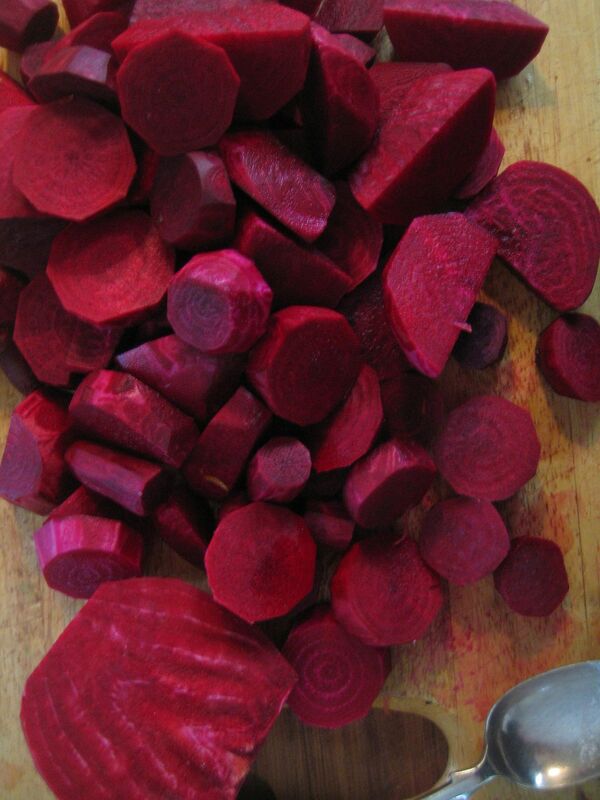 Raw beetroot is very good grated with equal quantities of carrot and apple. Squeeze over lemon and/or orange juice. No dirt flavour (although the younger the beet the better). p.s. pink fingers obligatory with this one. Nice pink fingers. Yummm, both those recipes sound good. Thanks! I like the idea of sweetening the grated beetroot with carrot and apple. Mine are coming to an end but I am hoping that I’ll get another crop in before summer hits too hard over here in the West. I’ll be taking note of all the other ideas however I mostly enjoy mine chopped to bite size, roasted with sweet potatoes & pumpkin, cooled, then tossed in lettuce (from the neighbouring bed) with chunks of Danish Feta and maybe a dollop of homemade Hommous.